ALBANY — It was a time for giving as Jocelyn and Christ Arndt treated a Hollow crowd to a handful of new songs on Saturday, Dec. 15. Though the dynamic rock band wields its recording magic at White Lake Studios, it was the first time in two years the brother and sister duo played before a Capital City crowd. That was also before the band charted on Billboard’s AAA Top 50 last December. Coincidentally, the anniversary in which the band first learned of that accolade was Saturday night, a fact not lost upon Jocelyn as she later shared the story with the crowd. See a slideshow of the show by clicking here. The night kicked off with an uptempo set from El Modernist. The Albany quartet had a storied 2018. 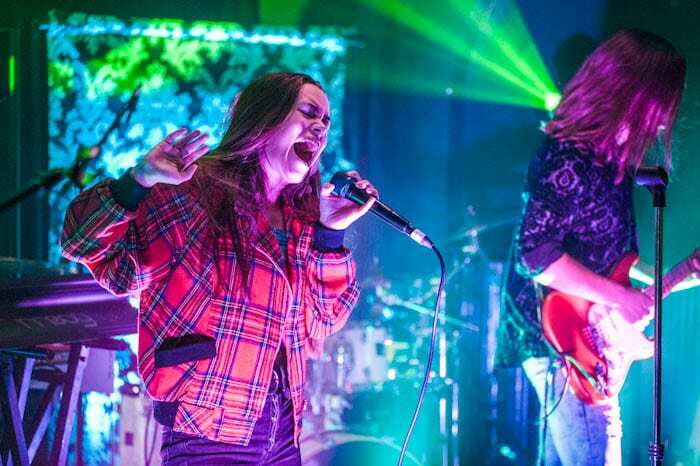 Considering the four only formed as a group on St. Patrick’s Day, it quickly earned a name during WEQX’s annual Battle of the Bands at Jupiter Hall. The band won top bidding and earned the coveted opening act for September’s Pearlpalooza. A three-track LP is in the works, with a targeted release sometime within the first quarter of 2019. Sasser brought everyone to church as he played the organ before a dimly light Hollow. He set the tone with a supercharged medley that started with “Footprints on the Moon,” and followed with “Too Much to Me” and covers “Hard to Handle” and “Seven Nation Army.” The last song featured the rare sight of Jocelyn slinging an electric guitar. Though Jocelyn and Chris are related through family bond, their respective stage presence is strikingly different. Jocelyn commands the most real estate on the stage, stretching and contorting her body in a way that must aid in projecting a commanding voice that has often been compared to Grace Potter. Chris, on the other hand, is relatively stoic — almost in a trance — as his guitar work lays down the foundation of the band’s blues sound. Jocelyn and Chris Arndt started 2018 on the Billboard AAA Top 50, with “Red Stops Traffic.” That success has drawn more attention to the band, which already has another album ready for release early next year. The band offered up four songs from the upcoming album — “Be That As It May,” “Kill in the Cure,” and “Sign,” and “Outta My Head.” Each of the four new songs places the spotlight on Chris’ exceptional play at lead guitar. The band closed the night out with “Gimme One Reason,” after the crowd coaxed it to remain on stage for an encore. There are plenty of reasons to believe Jocelyn and Chris Arndt will see another place on the Billboard charts. They each reside on the 11-track album set for pre-sale next January. I regret forgoing to see the band in the past. Saturday night’s performance was one of the best local shows of 2018. Albany may get another chance to see them again in March. When that chance presents itself, you best take it.